More badly cheaply made costumes for our film. 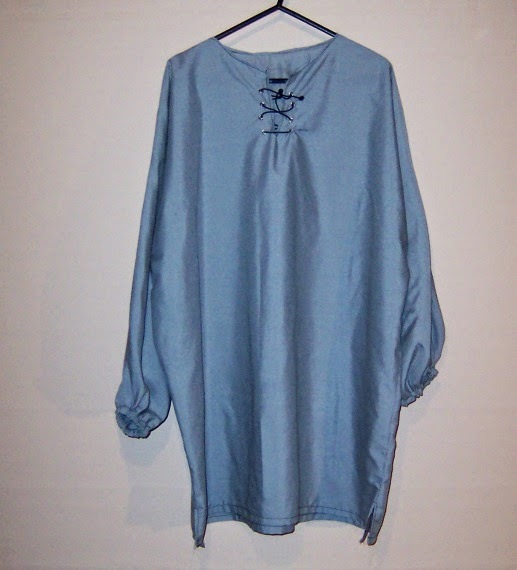 When dressing in a fairy tale/medieval style you need tunics. Loads and loads of tunics. And shirts just don’t make good tunics. At least not for the ‘common folk’ costumes, which can’t have fancy braid to cover the button down the front look of shirts. I added elastic to the sleeves to give them a puffy look. This is where my bad sewing and laziness becomes obvious. I used black thread cause it was on the bobbin and I didn’t have grey, and what the hey, its for a film. You can get away with a lot of fake in movies. 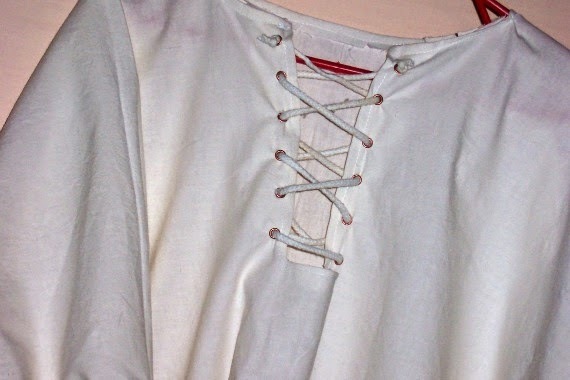 I bought myself one of those eyelet tools and a pack of eyelets in different colours for the lace up front which is a requisite for tunics. Took a few monumental fails putting on the eyelets but eventually I managed to figure out how to use the tool which came without instructions (not even those translated from Chinese to Russian to Swedish and then to English). Not the neatest eyelet/lace up setup I’ve ever seen, but hey… I blame the thin cotton fabric, the fact that I have no patience and no hand strength. I finished it off with some thin black string I found in my odds and ends. But hey… its for a film. And you can hide a lot of fake in movies. The second plain tunic was better. This one is for the cook and is made of cream fabric with white string. I put more eyelets on this one so it worked better. The sleeves are short cause I didn’t have enough fabric to make the T sides long enough. But its the cooks costume and I figure the cook can have her sleeves pushed up. The costume is finished off with a cap and an apron. The cap has no pattern. I simply cut a circle cut out of fabric, put elastic around the edge and lace trim. 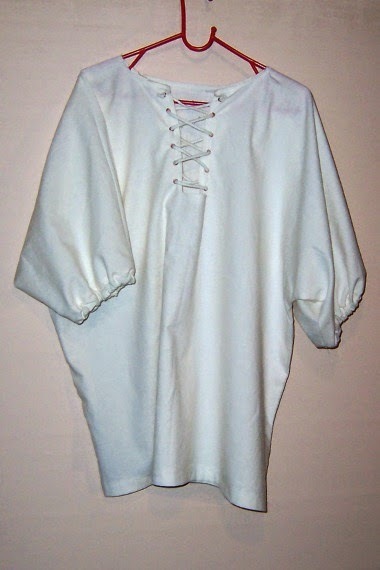 The apron is pretty plain, just a simple apron out of plain white cotton. Another costume, for one of the kings, is a cape and puffy pants in a heavy silver fabric. I got lucky with this fabric which I found at an op shop. I think its unlined curtain fabric, but its rich and very royal looking. 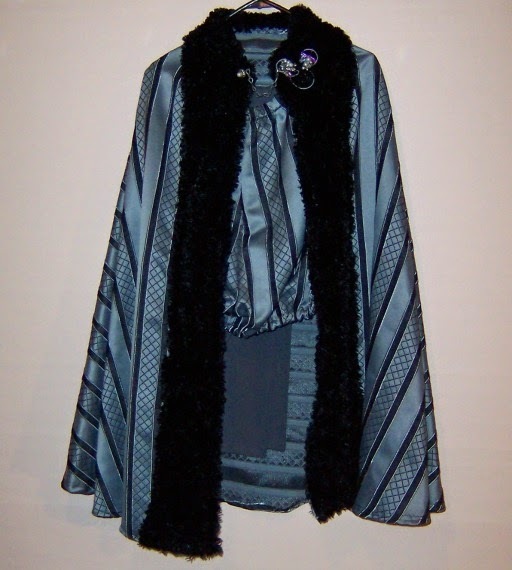 This cape will be worn with a pair of gray leggings (on loan from my wardrobe) and some fake boots (more on those in a later post). I also have a cap for this costume cause when this character is young he won’t need to wear his crown (also in a later post). Once the cape was hemmed I got a fluffy knitted scarf and sewed it on to give the impression of fur. Cause kings wore fur of course. 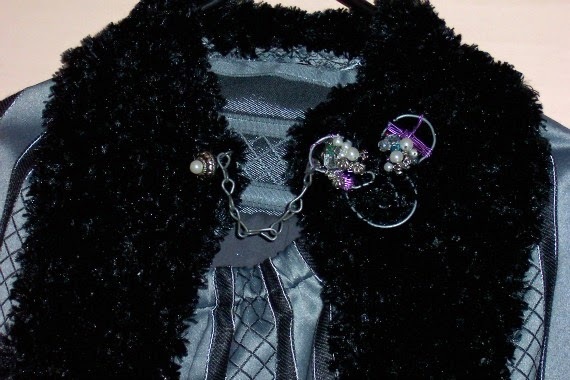 To finish it off I used beads, wire and a bit of chain to create a fancy way to hold the cape closed. Lastly, the cap was made the same way the cook’s cap was, only this time I had to made it in 4 sections to allow for the stripes in the fabric. 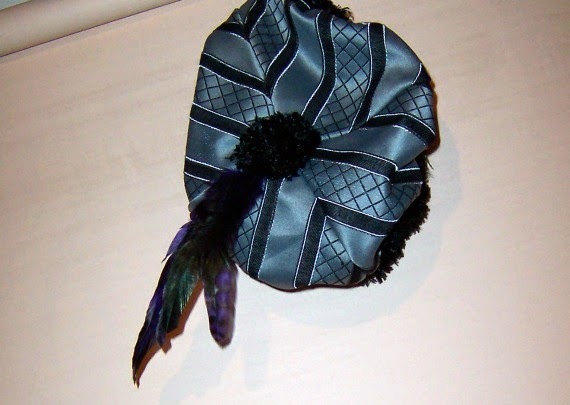 I trimmed the edge of the cap with a finer line of scarf/fur, made a scarf/fur pom pom for the top and added a couple of feathers. One thing that guys used to wear back then were tights and puffy pants. The skirt I found which I shared in Costumes Part 1 gave me the inspiration to base my ‘puffy pants’ on a more skirtlike design. 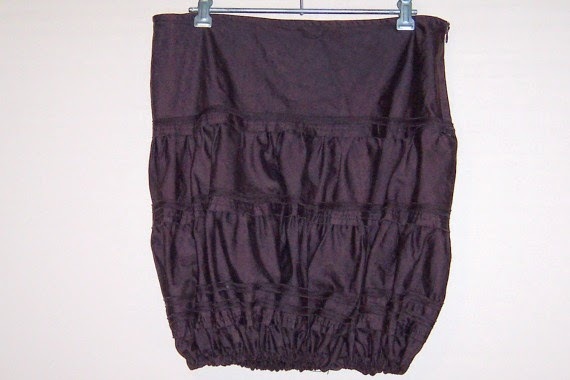 Instead of trying to make actual baggy shorts, I just made a skirt with elastic around the thighs which will bunch it up, creating a puffy look. Ok, I could have made shorts. I actually did make shorts. Huge fail. I’ve made trousers before, I know how to make a pattern for them… but for some strange reason the shorts I cut out in the silver fabric just did not work. 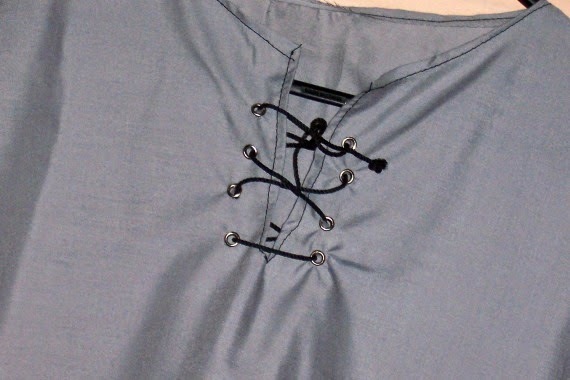 I did what any imaginative fake seamstress would do… I converted them to a skirt which would look like shorts. And you can hide a lot of fake in movies!